I have been struggling with this post for days now. I first tried writing about how Sebastian came to suddenly like beans last spring. I tried talking about the month this winter when the boys and I decided weeknights would mean there had to be beans of some kind for dinner. Lewis thought we were crazy, I had only meant it as a joke, but both boys loved the idea. My favorite part was the easy answer to "What's for dinner?" Everyday I would happily reply, "Beans, and something else." However every time I tried to write this post it was mind numbingly boring. I could not even write more then a few sentences before I was too bored to write anymore. Then this evening I finished off the leftovers as part of a clean out the fridge dinner and I realized I needed to give up on the cute back story. I just needed to share the recipe with you, before I totally lost the taste memory and could not describe it. 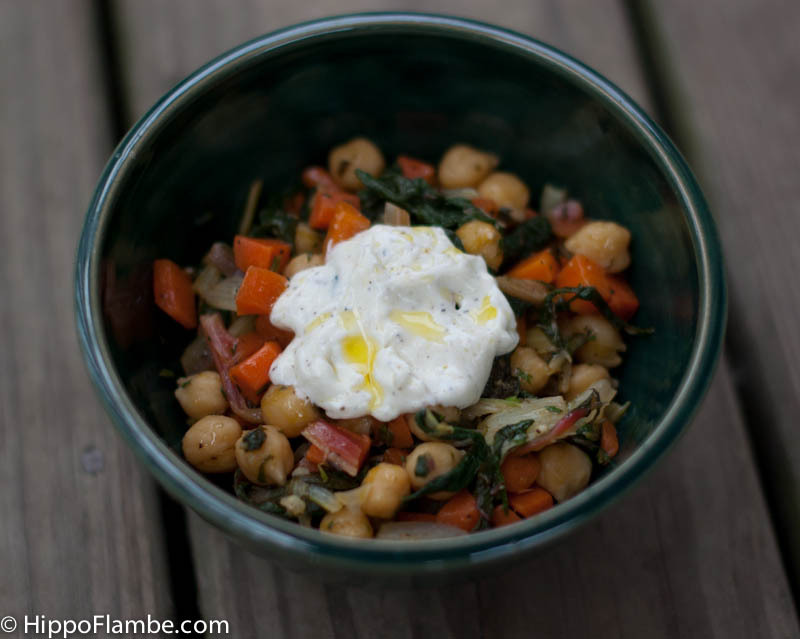 This dish is a chick pea and vegetable sauté with the simple twist of caraway seeds. It is funny how we tend to associate certain flavors with a single dish, like caraway with rye bread when really their flavor is very versatile and refreshingly unexpected when used elsewhere. 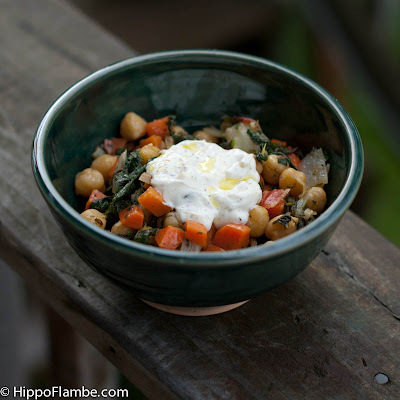 The carrots add a subtle sweetness, the chick peas are nutty, the chard has a slight bright tang and the caraway is the unexpected note that makes you crave more. I enjoyed it as much at room temperature tonight mixed with plain Greek yogurt as I did the night I made it and the Greek yogurt with the olive oil stirred in. Note: All the vegetable measurements can be tweaked depending what you have on hand. If you don't have chard the author suggests using a combination of spinach and chard without blanching them and adding a sprinkling of ground sumac or ground Persian lime, personally I think an extra squeeze of lemon juice would also give you a similar brightness, and I would try kale as well. Bring a large pot of water to the boil, while the water is heating separate the chard leaves from the stems, reserving both. Add salt to the boiling water and blanch the stems for 3 minutes before adding the leaves to the water. Continue cooking the chard leaves and stems for another 2 minutes before draining. Rinse the chard under cold running water to stop the cooking process. When completely cool, squeeze all the excess water from the chard and then roughly chop the chard. While the chard is blanching heat the olive oil over medium heat and cook the carrots and caraway seeds and sauté for 5 minutes. Add the chard and chickpeas and cook for 6 minutes, stirring occasionally. Add the garlic, lemon juice, salt and freshly ground black pepper to taste. Remove from the heat to cool before tasting to adjust the seasoning. Before serving stir the yogurt with the olive oil, salt and freshly ground black pepper. I served the yogurt on the side so everyone could decide for themselves if they wanted the yogurt on top. Your welcome, I hope you make it and enjoy it.